If you want the highest quality British made bathroom mirrors, look no further than the Imperial range. Imperial bathroom mirrors are stylish and designed to enhance your bathroom on their own or in conjunction with matching items from the Imperial bathroom range, including ceramic ware, vanity units and other bathroom furniture. There is a wide range of styles: rustic, plain, decorative, Art Deco and modern so there's bound to be a mirror to set off your bathroom. Bathroom mirrors are available in the Imperial Westminster, Astoria Deco, Thurlestone and Radcliffe ranges and further information on these mirrors can be found below. Imperial also supplies other mirrors that sit outside those ranges and also come in a wide variety of finishes. The Imperial range uses top craftmanship and the best materials throughout for truly luxurious look and feel. The company is a family business based in the Potteries with over two hundred years of creating the best bathroom furniture, successfully marrying modern and classic design with traditional methods. What size bathroom mirror should you choose? There are two elements to picking the correct size of mirror: practicality and style. From a practical point of view, you should ensure that the lowest edge of the reflecting surface is at a height where the smallest person likely to use it can see their face in it, although obviously this is impractical for smaller children. You may have to select a style with a narrow frame to enable the mirror to be mounted low enough. Equally the top edge should be high enough that taller people can see the top of their head without having to stoop. From a style point of view, it is usually better to have some wall space between the top of the basin and the lowest edge of a fully framed mirror. Having the lower edge flush with the basin edge doesn't look right except with frameless mirrors and even then it can look odd. Similarly, there should usually be a gap between the top of the mirror frame and the ceiling. Bear in mind also that taller mirrors will look better in bathrooms with tall ceilings. Having taken your measurements you can put limits on the height of your new mirror, then look at the different size options to see what mirror shapes and widths are available to you. Note also that many small and medium sized mirrors can be fitted with optional hinged brackets that bring the mirror away from the wall, allowing it to tilt to suit different people's heights. 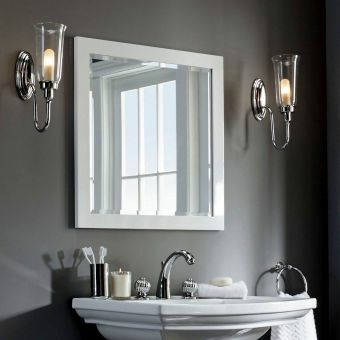 A mirror is essential in a bathroom, even if it's just one above a basin for shaving, applying makeup and fixing hair. But vanity mirrors come in all sorts of sizes and shapes and a careful choice can enhance the look of your bathroom. A larger than usual vanity mirror with a decorative frame can be a style statement in its own right rather than just a practical item. You don't have to stop at a vanity mirror, though, as additional mirrors can be useful in enhancing the light and space in a bathroom. If you are placing a mirror in a bathroom for a decorative effect rather than to be used practically, think about what will be reflected in it. If it can be positioned to reflect light and scenery it will do a lot more than if it's just reflecting a shower stall or bathroom cupboard. The Linea mirror complements the Imperial Radcliffe and Astoria Deco bathroom furniture ranges although it will also go well with the Westminster ceramic furniture range. The Linea mirror is square and inlaid with a glass border between the bevelled finish of the mirror and the wooden frame. This glass border can be either opaque or green glass. The frame finishes are Natural Oak, Wenge, White or Ash, all of which are made from sustainably sourced wood. The Imperial Westminster mirror is a large, rectangular mirror mounted in portrait mode with a decorative arched top moulding and a shelf at the bottom. The shelf has a decorative and practical metal rail around it to prevent items falling off. 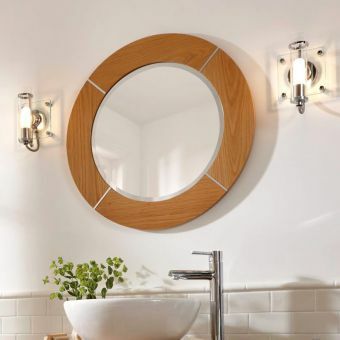 The mirror frame is available in White, Natural Oak or Mahogany and the rail can be supplied in Chrome, Antique Gold or Polished Nickel finishes. Westminster ceramic furniture has a classical style which can also be set off by Imperial's metal framed mirrors (see below). Designed to fit in with the Imperial Astoria Deco bathroom furniture range, the Barrington mirror is large and rectangular. It comes in two sizes: 1200 x 700mm or 610 x 700mm and can be mounted in landscape or portrait mode. The real wood frame is relatively slender compared to the overall size of the mirror, giving it clean contemporary lines. There is a wide range of finishes available. In addition to the three wood finishes (Wenge, Walnut or Natural Oak), your mirror can be hand-painted in White Linen, Cream Haze, Grey Ecru, Canvas Wheat, London Clay or Sage Thistle. 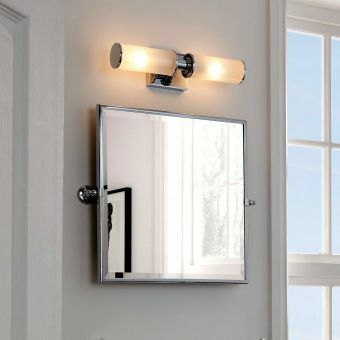 The Imperial Cuda bathroom mirror is a plain rectangular mirror with a relatively slender frame which is accented with a horizontal highlight line across it, a third of the way down. This helps it to complement other Art Deco inspired Imperial bathroom furniture and fittings and it is available in Natural Oak or Wenge. 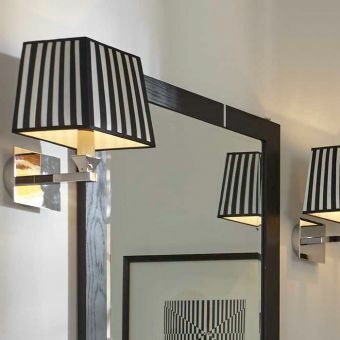 There is also the Imperial Astoria mirror which has a bold, wide frame with multiple ridges around it, creating a bold design statement with hints of Art Deco but also the chic Sixties style. It's available in landscape at 920mm by 730mm or portrait at 770mm in height and 605mm across, both of which have a depth of 20mm. There are two mirrors in the Imperial Carlyon range, very different from each other but tied together by Carlyon's clean, Art Deco-inspired style notes. 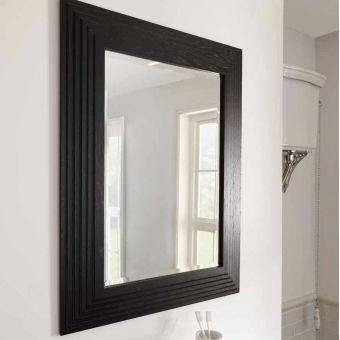 The Carlyon Rebecca is a rectangular mirror with a bold, wide wooden frame, the mitre joints of which are highlighted with metal strips, creating a bold design statement. The Carlyon Annabel has the same proportions and design cues but in a graceful circular form. The rectangular Rebecca is 850mm by 685 mm and the round Annabel has a 685mm diameter. Both are available in Natural Oak and Wenge or can optionally be hand painted in any colour you choose to match your bathroom perfectly. Simply pick the shape that best fits your bathroom style. 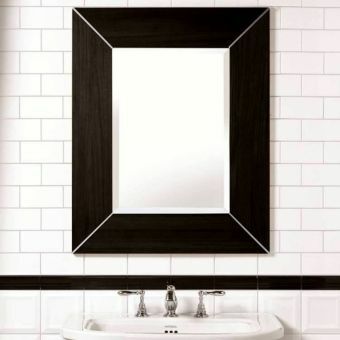 A similar mirror in the Carlyon Thurlestone range is the Diana, a rectangular mirror that comes with or without the metal strip highlights at the mitre joint. 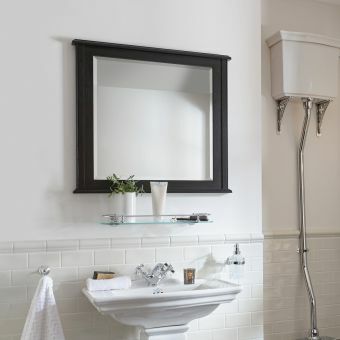 Also designed to complement the Radcliffe collection, the Thurlestone small mirror is inspired by Shaker design. At 690mm square and 45mm deep, it has a broad wooden frame that is capped top and bottom with overhangs for a classic Shaker look. Designed to be used with Istia and Avignon tilting mirror brackets, it comes in a wide range of wood or hand painted finishes. 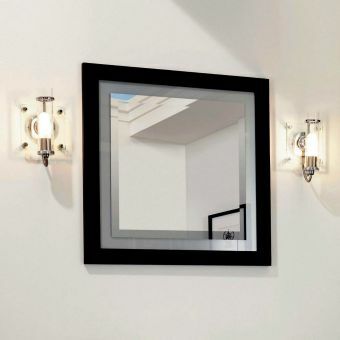 These two mirrors are both illuminated as the deep frames can incorporate the electrics for downlighters in the upper sections. The frame of the Box is the same depth all the way round with dimensions of 665mm high, 1165mm wide and 90mm depth. The Canterbury is 750mm high by 700mm wide with a depth of 110mm at the top, but the sides taper down towards the bottom for a dramatic look. The Canterbury can also be hung upside down so that the broader edge forms a shelf instead. Both are available in Wenge or Natural Oak and the Box can also be ordered in Dark Oiled Oak or Light Oiled Oak. They can also both be supplied in a wide variety of hand-painted finishes and, in addition to the spotlights, can be supplied with demister pads for steam free mornings. For a completely different look which would complement a period or contemporary bathroom, Imperial has a range of metal-framed mirrors. These are directly mounted to the wall with slender metal frames, available in Chrome, Antique Gold or Polished Nickel to match other metalwork in your bathroom, such as rails and accessories. They can also be mounted with the optional Istia and Avignon metal mirror brackets, which move the mirrors a little way away from the wall, allowing them to tilt to suit the person using them. These mirrors work exceptionally well with Imperial's Regent, Victorian, Edwardian and Westminster tap and ancillaries collections. Imperial also supplies a number of classical decorative mirrors to suit various different bathroom styles. 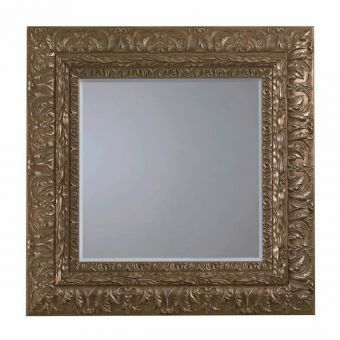 The gilt wooden frames are very ornate, bringing an air of sophistication and opulence to your bathroom. The square Genevieve and rectangular Florence mirrors have a broad frame with three different profiles, inspired by French styling, but not as over the top as Rococo. The rectangular Marie is more understated, with the frame far more slender in proportion to the reflecting surface. These are sizeable statement pieces which will enhance larger bathrooms, with the Genevieve being 610x610mm square, the Florence measuring 800x1000mm and the Marie 950x1250mm. At a number of points, we’ve talked about the option of fitting mirrors with brackets. 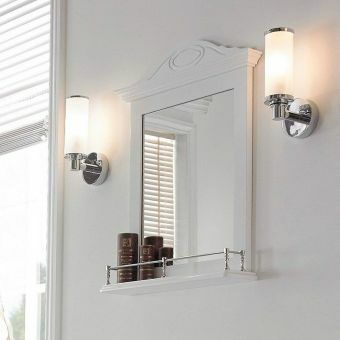 Imperial's stylish Istia and Avignon brackets bring your mirror out from the wall and allow it to tilt up and down so that people of different heights can position the mirror in a way that best suits them. These brackets will fit Thurlestone, Linea and Broadway mirrors among others, and are available in Chrome, Antique Gold or Polished Nickel finishes to match your bathroom's other brightwork.